Well. My son's game fell through due to illness of half the players (schools are Petri dishes...). So it looks like we might be doing our Come Endless Darkness game this weekend. Which means going after some Frost Giants. I wanted to finish up the G series at Gen Con, but we only got through G1(hill giants) and the unofficial G4 (stone giants). On the plus side it has allowed me some time to consult some other references. 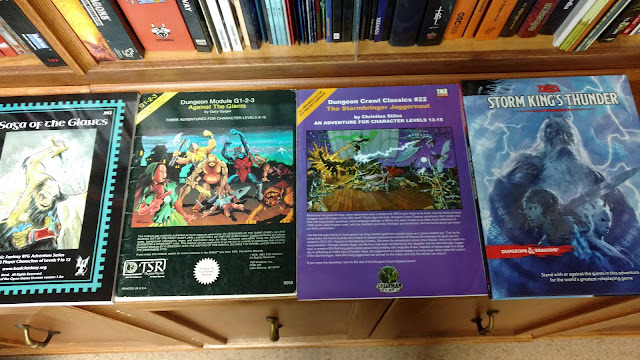 Storm Giants really didn't fit into my original idea, but I am going to give these a read and see what they have to offer. Giants... all day, ev'ry day.